The actual history of the United States’ worst-kept military secret revealed in graphic format. Though nearly everyone has heard of it, almost no one has known anything about it… until now. Located in the remote Nevada desert near the dry bed of Groom Lake, Area 51 is the most famous military installation in the world that doesn't “officially” exist. 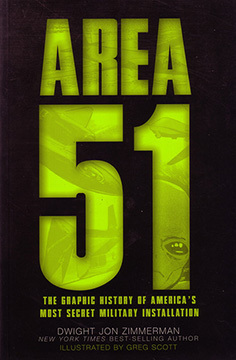 In Area 51, author Dwight Zimmerman and artist Greg Scott unravel the real history—minus the aliens—revealing in detail how for more than 60 years, the CIA, the U.S. Air Force, and aerospace company Lockheed Martin have all used Area 51 as a staging ground for test flights of experimental or highly classified aircrafts. Scott illustrates the Archangel-12 as well as follow-on aircrafts, such as the U-2, the SR-71 Blackbird, and the F-117 Nighthawk stealth fighter, while author Zimmerman tells the history of how they sprang from the research and development conducted at Area 51. This first-of-its-kind graphic history strips away the fantastical aspects of this mysterious location and establishes the actual, significant history made there. What is going on at Area 51? A cool book! Published at $19.95, our price only $9.95! AREA 51: The Graphic History of America’s Most Secret Military Installation By Dwight Jon Zimmerman. 94 Pages. 6x9 Paperback. Illustrated.